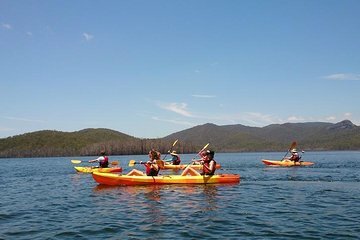 Escape to the serene waters of the Hinze Dam on this 4.5-hour kayaking adventure, including hotel pick-up. Spend an hour paddling around the historic dam, then hop off to explore the Dams Visitor Centre and soak up jaw-dropping views of the Gold Coast Hinterlands. Finish by tucking into a delicious breakfast or lunch (depending on option chosen) at the Hinze Dam View Café.